Pandey landed herself in trouble after a purported video, circulated on social media, showed her shooting an effigy of Mahatma Gandhi while celebrating the martyrdom of Nathuram Godse, who killed him on January 30, 1948. 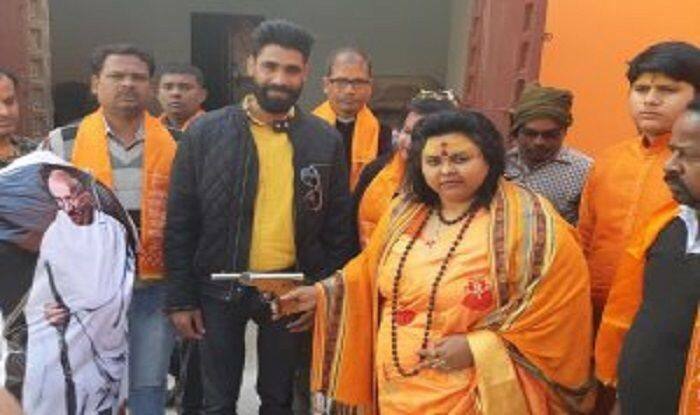 New Delhi: Aligarh police on Wednesday arrested Pooja Pandey, national secretary of Akhil Bharat Hindu Mahasabha (ABHM) and her husband Ashok Pandey from Tappal, for recreating Mahatma Gandhi’s assassination on January 30 in Uttar Pradesh. Pandey landed herself in trouble after a purported video, circulated on social media, showed her shooting an effigy of Mahatma Gandhi while celebrating the martyrdom of Nathuram Godse, who killed him on January 30, 1948. The effigy was later burnt at Hindu Mahasabha office in Gandhi Park. The Mahasabha had announced that it would observe Gandhi’s death anniversary as ‘Shaurya Diwas’. National spokesperson of ABHM, Ashok Pandey had reportedly said that the rcreation of Gandhi’s assassination was done on purpose inside their office premises. He added that the members did not consider the act as wrong and equated the act to the burning of Ravana’s effigy on Dussehra. Last week, the website of the All India Hindu Mahasabha was reportedly hacked by a group calling itself ‘Kerala Cyber Warriors’. “Gandhi ji always remained an inspiration for people globally to follow right path, the path of non-violence in all their actions. Nobody can hurt me with my permission. An eye for an eye only ends up making the whole world blind. (sic),” read messages on website.